Customized SharePoint training at the Centers for Disease Control - S&K Technologies, Inc.
Gabe Patton hosts a training for CDC employees who are administrative users of SharePoint at the CDC in Georgia. He developed the training series and materials from scratch and is helping to promote its use around the campus. 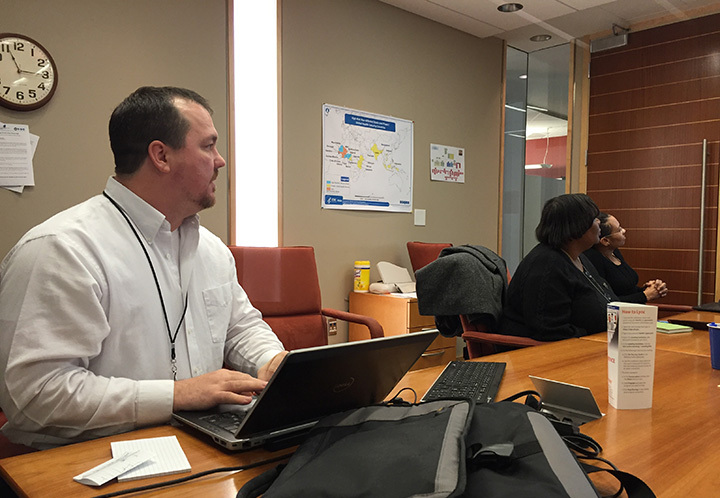 Officials with the CDC Division of Global Health Protection (DGHP) asked Gabe to help advocate increased use of the SharePoint system by training a group of “Power Users”. Because DGHP has tasked SKGS to quickly implement solutions, there were no government training materials that adequately addressed this need, so Gabe deployed a number of customized SharePoint sites with training materials and videos. Gabe personally trains the federal civilians on how to use SharePoint instead of Excel for lists and tables, where appropriate. He also was a feature presenter to the CDC’s first Development Committee forum for adoption of best commercial practices, and Gabe laid out a new process using SharePoint to automatically generate a newsletter without technical intervention, tailored to supervisory personnel. The DBHP has a global impact in disease control and prevention. Gabe’s efforts not only as a developer-but also as a SharePoint advocate, facilitator, and bridge to best commercial practices-is helping the CDC foster collaboration and automation of routine tasks.